Summer may be on its way out, but it’s not all bad – because when the weather starts to turn we have the perfect excuse to go shopping! Whatever the state of our personal finances (and with a lingerie addiction, it’s not always pretty! 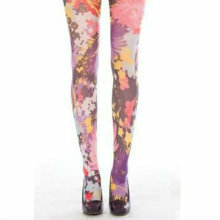 ), one thing there’s always room for in the budget is some new tights. New hosiery is the perfect way to give your wardrobe a fresh update without breaking the bank, and legs are high on the fashion agenda this season. Whether you go bold and graphic or take a more sophisticated approach, there’s a legwear trend to suit you. Here are some highlights. If the season’s bold, graphic patterns are a little bit out of your comfort zone but you want something a bit more exciting than plain black, then you’re in luck. Go for intricately patterned opaques that offer detail in a subtle way so your legwear complements rather than dominates your outfit. Try: Floral Opaques Tights from Charnos, £10 from tightstightstights.co.uk, for a floral design that doesn’t overwhelm; Pierre Mantoux’s richly detailed, shimmering Sandrine Tights, £23.99 from UKtights.com; or Pamela Mann’s Dogtooth Opaques for a contemporary take on this traditional pattern. £6.99 from Amazon.co.uk. Shine is back! From wet-look finishes and lurex to metallic shimmers, this winter will be all about a glossy sheen with a bit of a sci-fi edge. Go extreme with an all-over shine or tone it down with shiny elements like metallic studs or lurex details, it’s up to you how far you take this trend. Try: Pamela Mann’s leather look leggings, £24.99 from Mytights.com; Gipsy’s Metallic Tights, £5.99 from gipsytights.com; or these Lurex Spot Opaques from Charnos, £10 from Figleaves.com. You can go crazy with all-over bold patterns this season, or you can keep it simple and understated. The ankle is where it’s at for subtle patterning for Autumn/Winter 2013, whether it’s flowers trailing up the back or a cute little detail on the ankle bone – express yourself in the details. Try: Le Bourget’s Papillon Tights, £16.50 from stockingsdirect.co.uk; Moulin Rouge Swarovski Windmill Tights, £35 from Mytights.com; or Fiore Mandisa heart motif tights, £3.95 from StockingsHQ.com. Next post Win a set of Tutti Rouge underwear!